The divided gusseted front pocket is is large enough to accommodate up to four pairs of shoes. The inside features 2 mesh pockets for undergarments, ties, scarves and belts. Four to six suits can easily be packed on the inside two wally hooks and the foam roll bars prevent clothing from wrinkling. 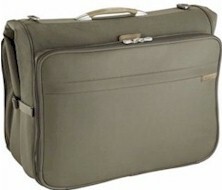 On the Outside, the garment bag can be carried by the non-slip shoulder strap or the convenient top carry-handle. A dual purpose back pocket allows you to slide the bag over the One-Touch Outsider Handle System for fast, convenient travel. And the elastic, hide-away ID card conceals personal information. Available in black and olive only. In the Inside, the roomy main compartment allows for 3-6 days of packing. Great for business trips.